Each picture of the Two Hearts is 8″ x 10″, is printed in Italy, and is matted on cardboard for immediate use (frame not needed). Sold in 2-picture sets only. 1. Purchase and display the image of the Two Hearts in your home and/or office. Get extra sets for relatives, friends, and prayer group members… makes the most perfect gift ever! 2. Entrust yourself to the Two Hearts by reciting a Consecration Prayer (see Suggested Consecration Prayers). 3. Practice a daily devotion of faith and prayer to the Two Hearts of Jesus and Mary. Consecration to the Two Hearts of Jesus and Mary promises great graces and protection upon you, your family, and your home. It also helps to prepare us for the coming Era of Peace whereby the world will experience the Triumph of the Immaculate Heart and the New Eucharistic Reign of the Sacred Heart. The Miraculous Medal vision to St. Catherine Labouré revealed the image of the Two Hearts of Jesus and Mary united, side by side. 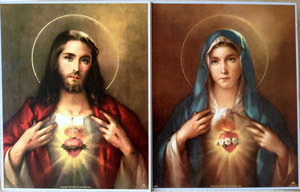 Jesus told her that those who venerate the image of the Two Hearts would receive great graces. The Angel at Fatima prostrated himself before the Blessed Sacrament, praying: “By the infinite merits of the Sacred Heart of Jesus and the Immaculate Heart of Mary, I beg the conversion of poor sinners.” This should be our prayer as well. consecrate myself wholly and unreservedly to You! worship and winning, if possible, all hearts to You. my heart from You again. eternity. Most Sacred Heart of Jesus, have mercy on us. of God, in time and in eternity. Amen.